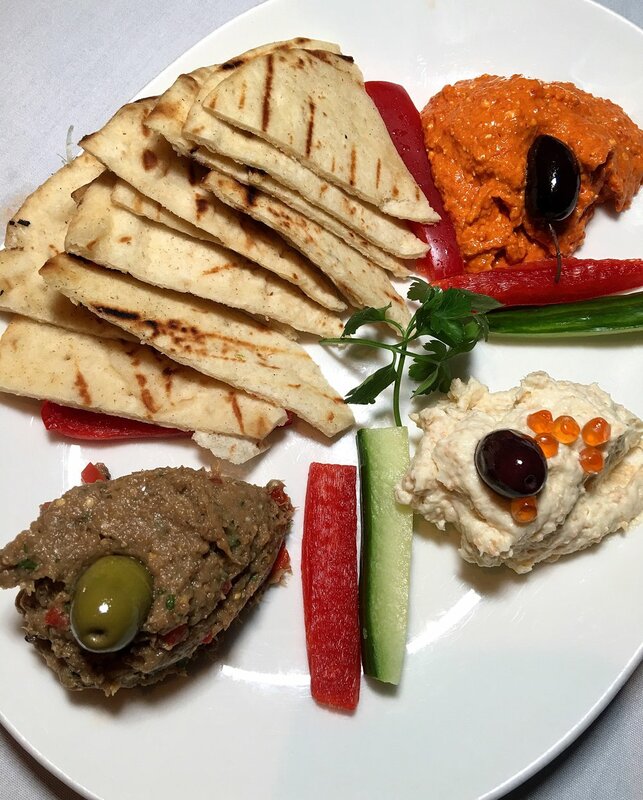 I enjoyed a happy hour at Estia, my firs time dining there. The first thing that I immediately noticed was the beautiful decor. If you haven't been to Estia, it's definitely one of the most loveliest places to dine in the city. As soon as you enter, ahead there's a display of fresh seafood that they sell for the day. If there's a piece that isn't up to par, they won't sell it. They make sure to serve the best catch each day. Once seated, we started with the Horiatiki Salata. It consisted of tomatoes, cucumbers, feta, , red onions, green peppers and olives with a red wine vinaigrette. This was a refreshing, light dish to enjoy. We were also served the Estia Chips. These were eggplant and zucchini fried crispy served with tzatziki sauce. It was incredible. I could have eaten these for my entire stay and been satisfied. I loved the crisp texture, similar to a potato chip. Now it was time to enjoy a few cocktails. We had The Axios- Absolut Elyx - made with fresh watermelon juice, chili basil syrup and lime served in a copper pineapple cup; The Noble Tonic - made with Junipero Gin, fresh citrus, Gai'a Retsina, rosemary and a splash of tonic; The Father Thyme - made with Hornitos Reposado infused with thyme, Amara Liqueur, lime and blood orange soda; Dionysus - made with House infused berry vodka, fresh lemon, simple syrup topped with sparkling wine; Pomegranate Margarita - made with Hornitos Plata, rosemary simple syrup, lemon, lime and pomegranate juice; and last we had The Mastika Mule - made with Roots mastika rinse, Stoli Vodka, fresh lime juice, simple syrup and ginger beer. My personal favorites were the Father Thyme and the Pomegranate Margarita. Other featured dishes were the Octopodi and the Spread Pikilia. The Octopodi is charcoal grilled octopus with red and sweet onions, dill, capers, roasted peppers, parsley and red wine vinaigrette. Octopus is one of my favorite things to eat. I highly recommend this dish if you love octopus just as much as I do. It was very tender and the charcoal grilled taste was delicious. The Spread Pikilia was a dish with grilled pita that featured three different spreads. The Tzatziki is made with yogurt, cucumber and dill. The Htipiti is made with roasted red peppers and feta cheese. And the Melitzano Salata is made with roasted eggplant and taramasalata (carp roe and potato). A huge thank you goes out to Anastasia for being so gracious and hospitable. And another thank you goes out to Betty our excellent server for making our experience an enjoyable one. Happy Hour is Monday - Friday from 4pm to 6pm. You can even enjoy weekend happy hour on Sunday's from 7pm until close.